You may already have seen ATLAS on your social media feed. 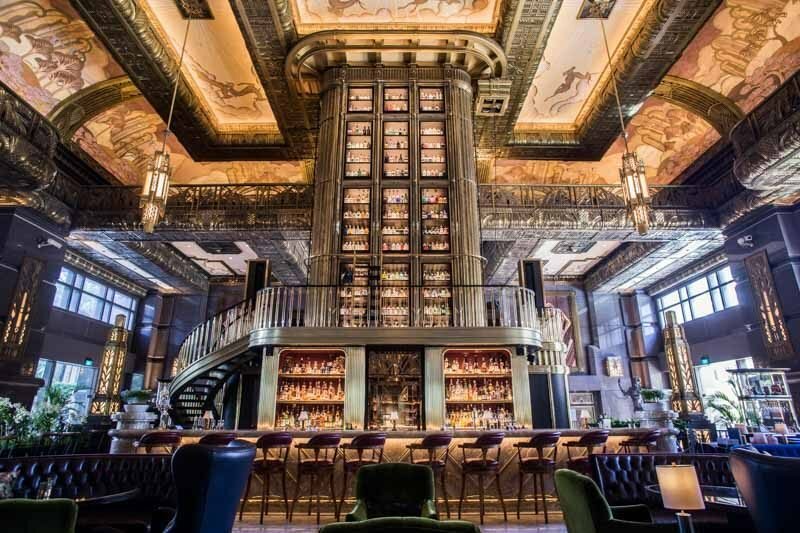 With incredibly high ceilings, lavish golden decor, and a gigantic tower that is stocked with over a thousand types of gin, it’s hard not look twice at this gorgeous place. ATLAS is located in Parkview Square (which some locals have dubbed as the ‘Gotham Building’) and is a fine place to enjoy drinks and dinner while soaking in the grandeur of the space. We came to ATLAS to try its new menu, but first, let’s talk drinks. We started with The ATLAS Martini ($24). Made with London dry gin, Ambrato vermouth, and champagne vinegar, this martini packed a sour and slightly bitter punch that was strangely addictive. The ATLAS selection of Gin & Tonic ($19) was really good as well. You can select whatever gin you want from the ATLAS collection, and it will be paired with a Burma Tonic that was deliciously fizzy with just the right amount of sweetness. We also tried the Four Pillars Bloody Shiraz Gin ($20), a digestif that was aromatic and sweet with a peppery finish. Order this if you like your gin to have a bit of a kick in your drink. 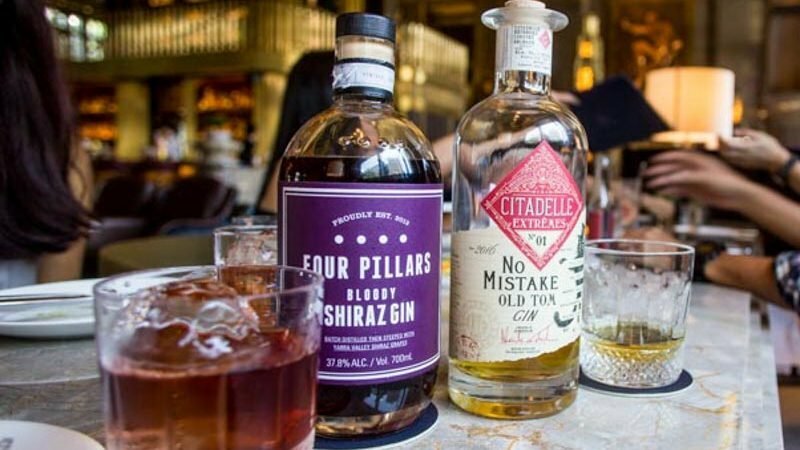 You can also consider the Citadelle No Mistake Old Tom Gin ($24), a classic gin that has been aged with caramelised Caribbean brown sugar. Make no mistake, sugar doesn’t make this gin a ladies-only drink. This Old Tom Gin packs a punch with 46% alcohol and strong notes of florals and botanicals. 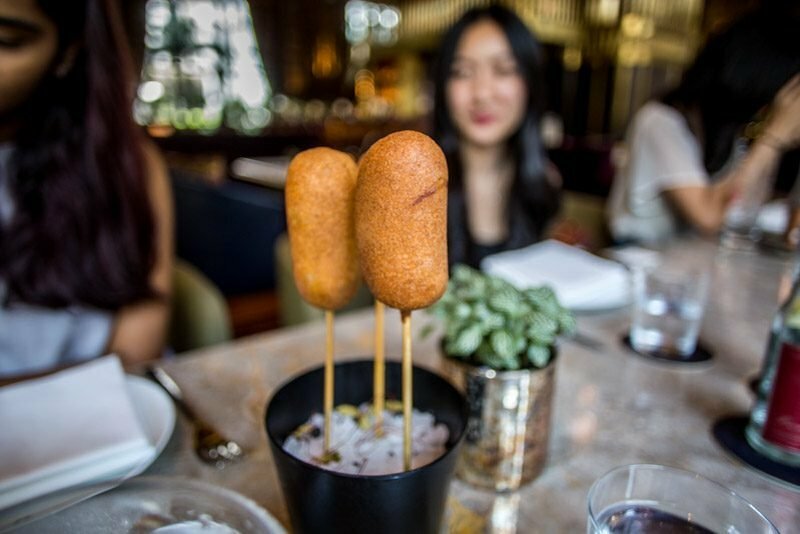 Moving on to food, we started with a dish that totally surprised me — corn dogs. American street food was probably the last thing that I thought would be served here, but these NZ Lamb Corn Dogs ($16) were served in a sort of atas way, with the corn dog skewers placed in a pot of pebbles. The corn dogs were not crispy at all, sadly, but the lamb spiced with juniper berries and other herbs were very fragrant and really made up for it. I liked the second dish a lot more, the Fresh San Marzano Tomatoes, Stracciatella Cheese, Caper Leaves, & Bread Crisp ($28). 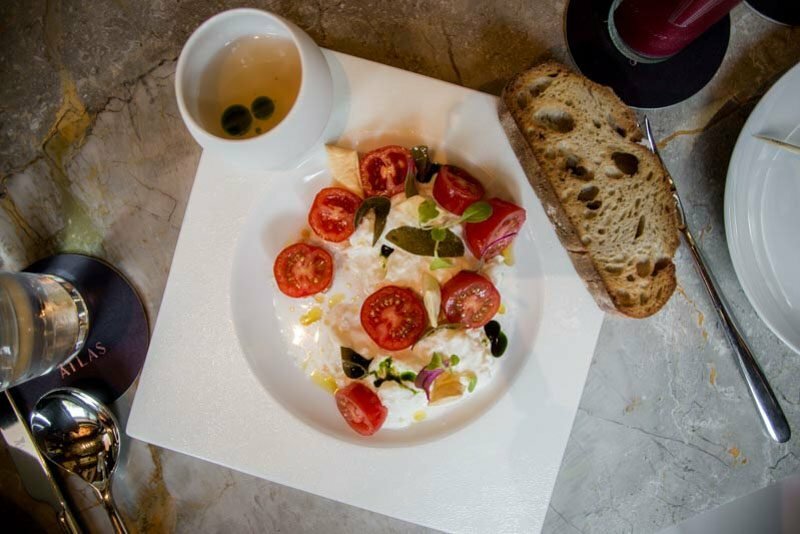 The stracciatella cheese was deliciously light and moist, perfect for eating with the crusty bread. The fresh and juicy tomatoes were hearty and mildly sour, helping me refresh my palate with every bite. The Madai Sea Bream Tartare ($28) was a pretty good dish as well. 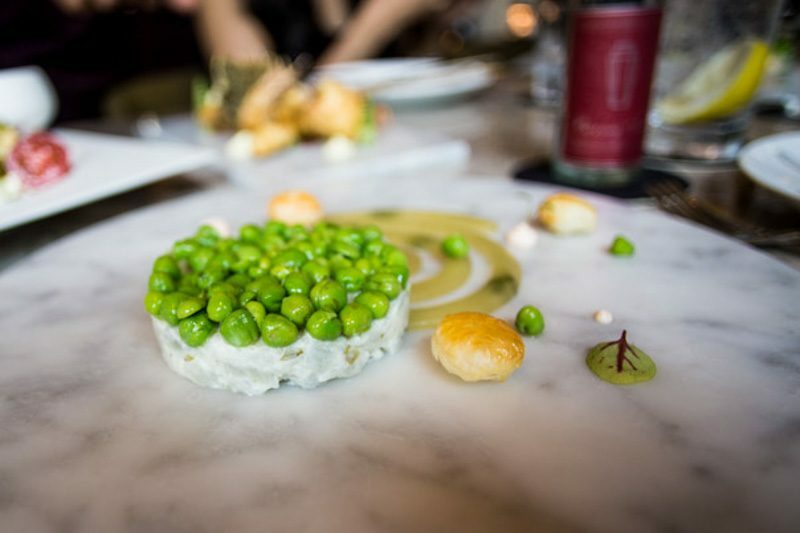 Served with sweet green peas, salmon mousse, tiny puff pastries, and a celery jelly that resembled a mosquito coil, I was slightly apprehensive at first. However, my first impression was quickly cast away with just one spoonful. All of the ingredients came together like a symphony in my mouth. Do not miss the tartare if you’re going to order a cold main. 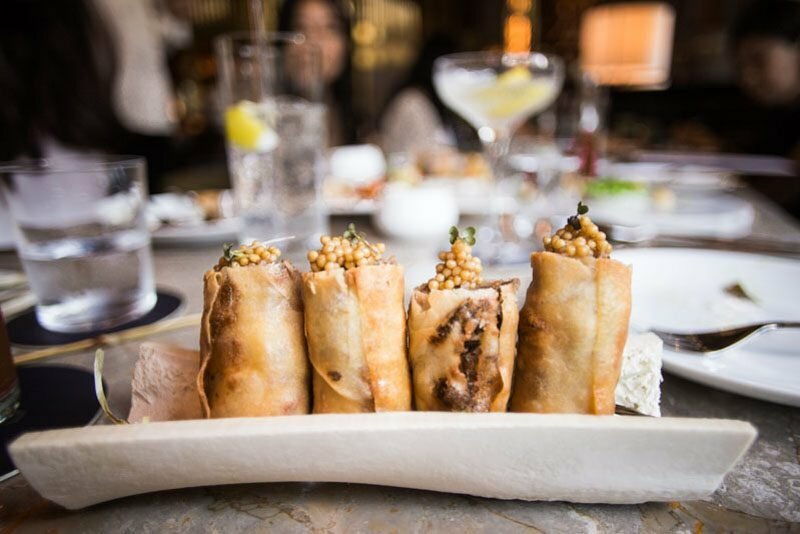 If you want something a little hotter, get the Smoky Beef Puffs ($18) which come with a tiny mountain of pickled mustard seeds on top of each roll. The cool thing is that these rolls are served on an actual bone of a cow. This gets points for both style and taste, as the beef was piping hot and well spiced. 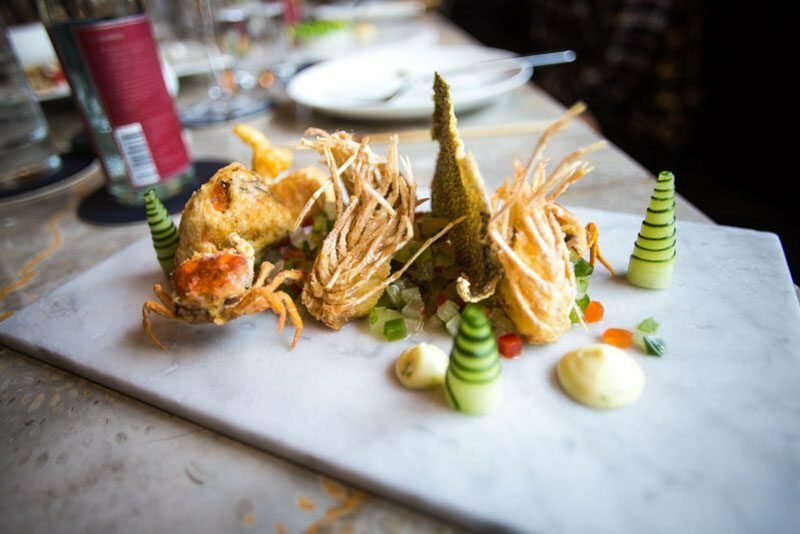 My favourite dish at ATLAS was the Crispy Prawn Heads, Cod Skin, Sawagani Crabs ($24) that is served with cucumber relish. This small seafood platter comes with big flavours. The eyes and feelers are removed from the prawn heads, so you can enjoy the hearty taste without being too distracted. The cod skin tasted a little like keropok, whereas the tiny crabs were mostly crunchy, with a tiny morsel of meat inside. I enjoyed this dish particularly because of the comforting local flavours that it boasts, and it’s a must-order if you enjoy seafood. 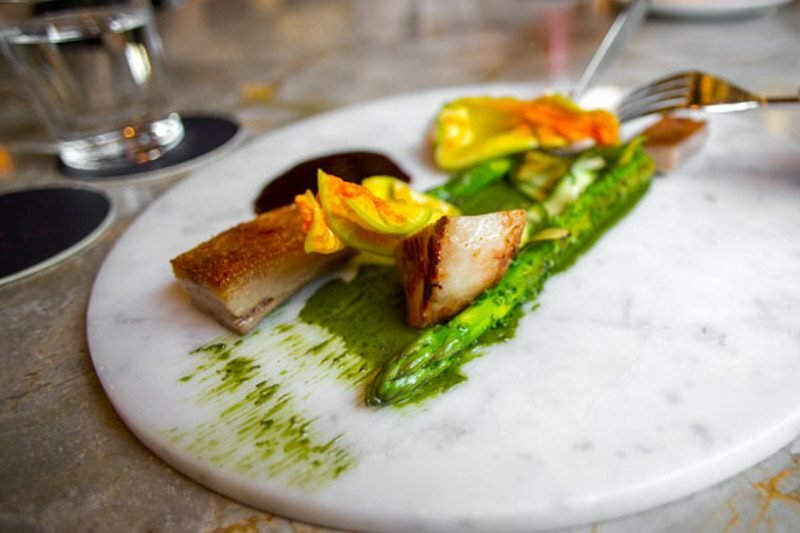 Next, we had the Suckling Pig ($46) with burnt bread sauce, zucchini flower, and asparagus. The meat portion consisted of pork belly, which was flown in from Spain, and pork loin that was flown in from France. The burnt bread sauce was creamy, mild, and complemented the juicy chunks of pork well. 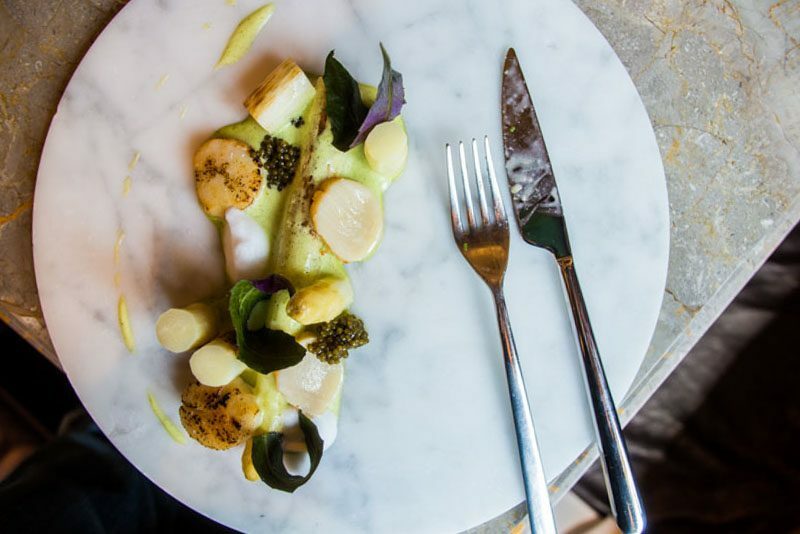 The Buttery White Asparagus ($58), which is served with Hokkaido scallops, 5g of caviar, and milk foam, was a balanced dish that was relatively mild, with the grilled scallops and caper leaves bringing a slight saltiness to the palate. Another dish we had which featured caviar was the ‘Gragnano’ Spaghettini ($62), that comes with 5g of caviar that is mixed in confit egg yolk, as well as a serving of bottarga (cured fish roe). 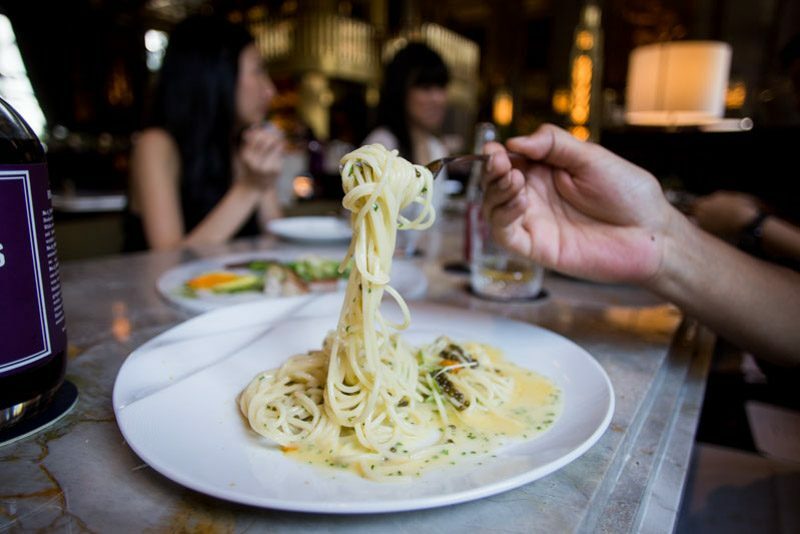 As expected from the egg yolk and cured fish roe, the pasta was delightfully rich in terms of flavour. Surprisingly, the texture of the sauce was light and thankfully not jelak. We ended our meal with desserts – A LOT of desserts. 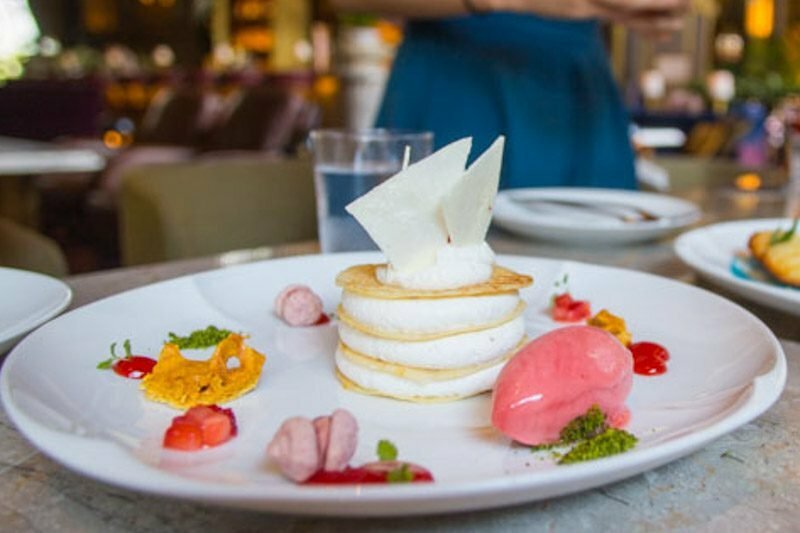 Each dessert is priced at $18 and is crafted meticulously with ingredients that complement one another well. For a more fruity and tangy taste, get either the Everyone Loves a Pina Colada ($18) or the Nubian Sponge Cake ($18). 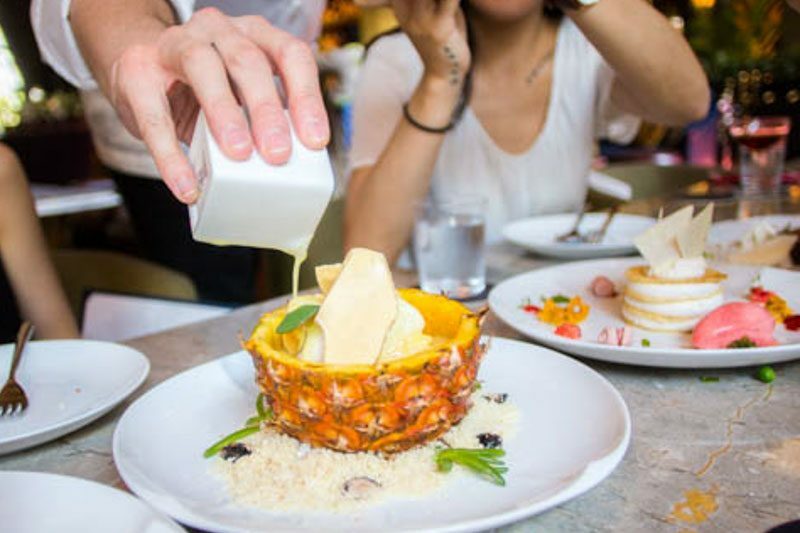 The former comes with ice cream, tapioca, and pineapple chunks in a pineapple husk, and the latter has strong notes of mandarin orange that is balanced with white chocolate and raspberries. 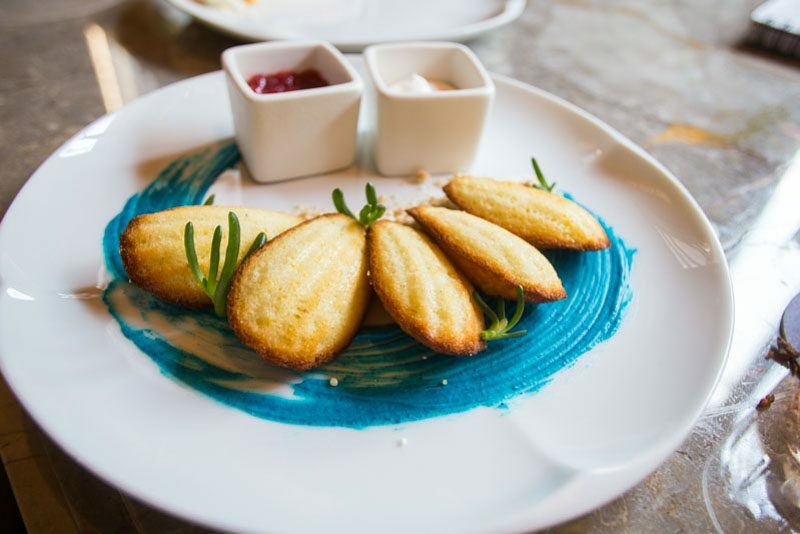 For more classic English desserts, go for either the Crepes Mille-Feuille ($18) or the Warm Madeleines ($18). Both of these desserts were sweet without being cloying, and would go perfectly with some tea. We also had two desserts which were pretty icy and a nice way to end the meal. The first was the Pear Snow, Brandy Sabayon, Stretchable Chocolate & Pistachio Sponge ($18). 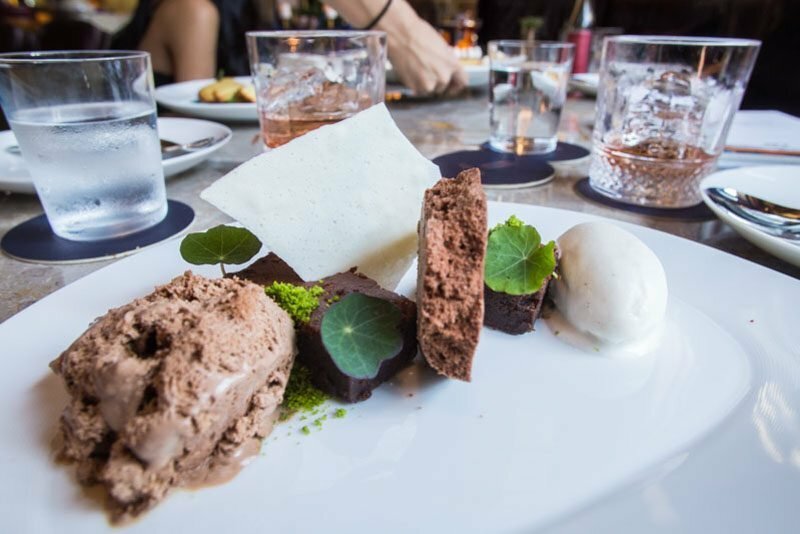 The chocolate was velvety, and the pear snow was refreshing in contrast. Though it was a good dessert, I prefer and recommend the Frozen Milk Chocolate Water, Milk Ice Cream & Palmer’s Brownie ($18) which was great in terms of texture and taste. 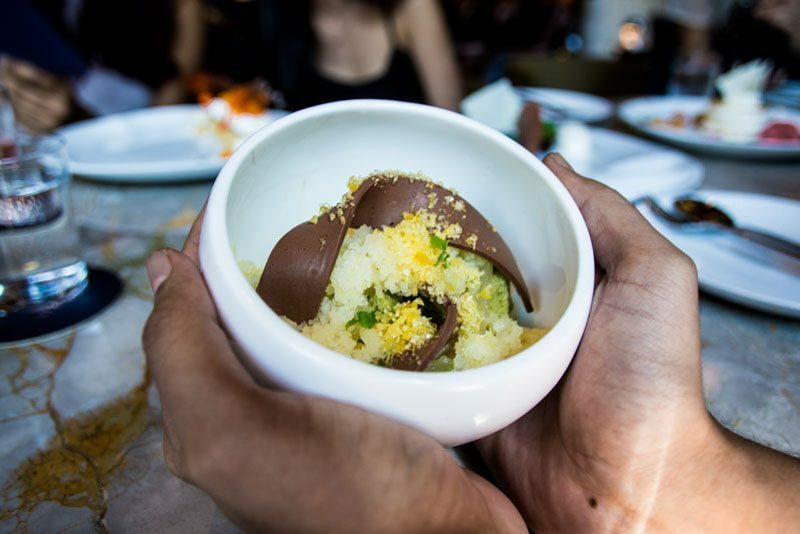 The milk chocolate is carbonated to produce a delightfully crumbly texture, and the white chocolate milk crisps that garnish this dessert disintegrate in your mouth within seconds. 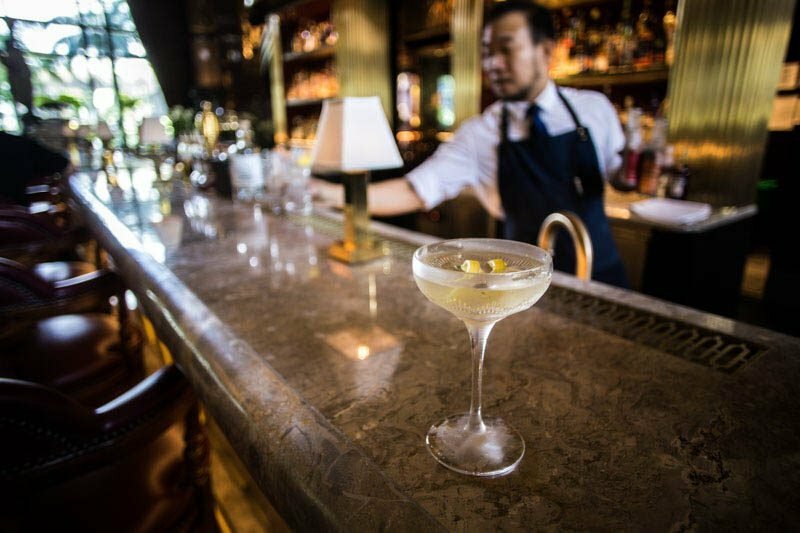 Every Singaporean who enjoys gin needs to visit ATLAS at least once in their lives. Even if you’re at a loss with what to order, with over 1000 types to select from, friendly sommeliers will help you find the drink that best suits your palate. 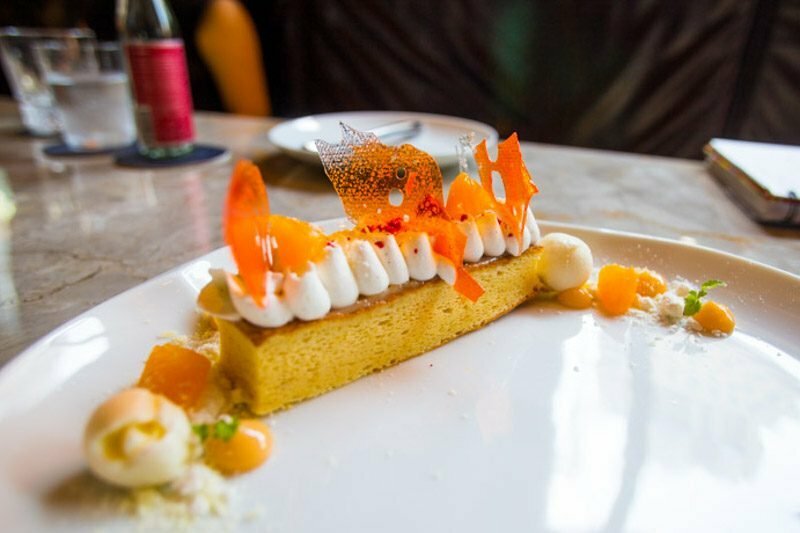 But of course, ATLAS is a lot more than just gin; there are also lovely desserts and good fine dining mains. 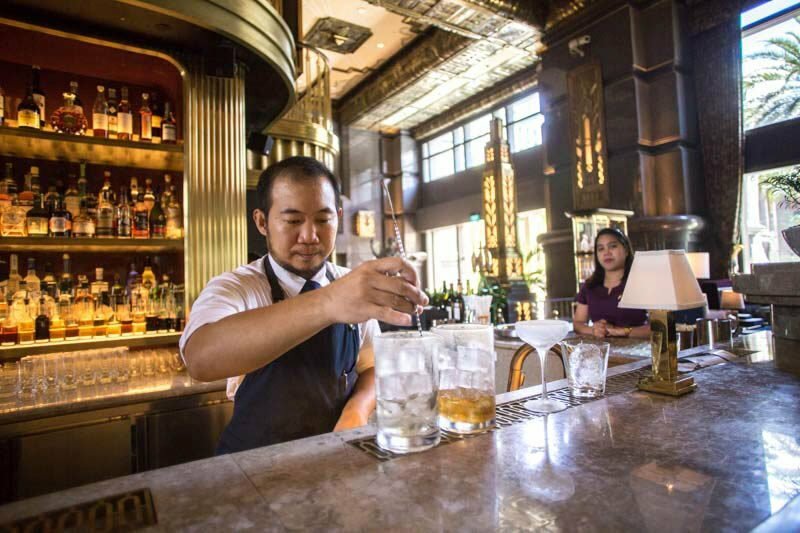 Many of the dishes go well with a drink in hand, so consider getting some mains to elevate your experience at this grand bar. This job has got me trying to balance the scales between delicious food and my weight.